Are you tired of wearing dentures? Do you need to replace your teeth? Have you been told you need expensive or extensive work to save your teeth? Tired of slipping, uncomfortable dentures that don't allow you to eat well or smile confidently? With TeethXPress™, your dentures or failing teeth can be replaced with an implant secured denture in a single day. At no time will you be required to wear a removable denture. Conventional dentures are designed to give you the appearance of natural teeth, but not actually replace your natural teeth. You may have noticed that your denture that once fit well now slips constantly and requires costly visits to the dentist for adjustment. That's because every day that you wear a denture, the bone in your jaw shrinks a little more. Eventually the denture won't fit at all and you will have to replace it. TeethXpress is a very different solution. You will still have beautiful natural looking teeth, but now they will also function like natural teeth. The TeethXpress solution secures your denture to surgically placed dental implants so that you can eat, speak and live confidently without the fear of slipping dentures. Dentures supported by dental implants have been successful for hundreds of thousands of people. The number of patients with dental implants is growing rapidly due to their effectiveness, long-term durability and the high success rate. Every patient is different and patient results may vary. Only a trained clinician can choose the best treatment plan for you. Please ask us to explain the benefits and risks to determine if the TeethXpress solution is right for you. After you have met with Dr. Khalid and created a personalized treatment plan, we will schedule the TeethXpress procedure. During the procedure, 4 to 6 implants are surgically placed into your jaw with abutment posts. Your denture is then secured to the abutment posts with special prosthetic screws. The TeethXpress procedure typically can be completed in one day�and can be done under local anesthesia. Your dentist will either use your existing denture or have a denture created prior to the procedure so that you walk out that day with teeth. Discomfort from TeethXpress is usually minor and temporary. Your periodontist may prescribe pain relievers for you as needed. A soft diet will be required during the initial healing phase. 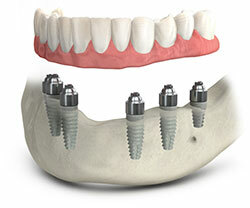 Dental implants are the standard of care for tooth replacement. They are bonded with the bone to provide permanent support for crowns and dentures. What happens when wearing a conventional denture? Your jawbone begins to shrink from lack of stimulation. Losing your teeth will affect your smile and change the shape of your face, causing you to look prematurely aged. Who is a TeethXPress candidate? TeethXpress can be placed in most adults who have lost most or all of their teeth. Please ask your periodontist to explain the benefits and risks to see if TeethXpress is right for you. No, the procedure is typically done under local anesthesia. Most treatments can be completed at our office. How soon may I return to work after treatment? You may return to work the next day unless otherwise instructed by your clinician. You may be prescribed medication to alleviate any minor discomfort you may have. How long does the TeethXpress procedure take? The implants can be placed in as little as 30 to 60 minutes depending on the location and the number of implants placed. The TeethXpress protocol requires 4 to 6 dental implants be placed to secure your denture. The total procedure will typically require 3 to 4 hours. Your periodontist can give you more exact time estimates at your initial consultation. TeethXpress is designed as an immediate solution so that you walk out the same day with secure natural looking teeth. Complications may occur that require your dentist to delay securing your denture to the implants, but you will always leave with teeth. Talk to Dr. Khalid about potential complications. Initially you will only use a mediated mouth rinse prescribed by your TeethXpress dentist. Once your mouth is healed, you will use a waterpick to clean around the implants and under the secured denture. You will also schedule regular follow up visits with your TeethXpress dentist for cleanings. Implants can last many years if cared for properly. Many implants have been in place for more than 40 years. What is the success rate of TeethXpress and dental implants? BioHorizons dental implants have an extremely high average success rate (99.2%). How does the long-term value of TeethXpress compare to other treatment options? The dental implants, used for TeethXpress, are low maintenance and provide you with a stable, secure and confident smile. Therefore, the long-term value of TeethXpress far exceeds conventional treatment options. Is TeethXpress covered by insurance? Insurance policies vary but most cover a portion of the restorative procedure. Financing options are often available with competitive interest rates, and payments can be tailored to your budget. I would give them 5 stars but... it is dentistry after all. The staff are friendly and caring. I would recommend their service.